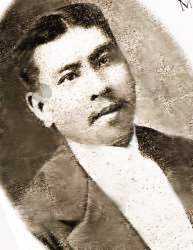 Edilberto Evangelista is not a popular Filipino hero. His name doesn’t generate instant recognition.It doesn’t even ring a bell. In Cavite City,there is a street called E.Evangelista, but to many Cavitenos, Evangelista might just as well be a name of a street and nothing more. A closer look at the man ,however, would reveal him to be extraordinary in more ways than one and deserving a better place in our Filipino hearts and minds. a cattle dealer, a tobacco merchant and later a contractor of public works before he departed for Europe. Another famous hero in the person of Jose Rizal, convinced Evangelista to take up Engineering in the University of Ghent in Belgium where he graduated with honors. He had several offers of lucrative job positions in both Europe and Latin America but he turned them all down because he felt that his services were needed more in his country than anywhere else in the world. Evangelista came back to the Philippines in September of 1896 ,a few weeks after the outbreak of the Philippine Revolution against Spain. He was jailed because he possessed copies of 2 novels of the hero Rizal which were considered illegal then due to its sedition theme and contents. Upon his release, he went to Kawit ,Cavite to join the revolutionary forces of Emilio Aguinaldo, thus becoming an adopted son of Cavite. Evangelista is one of the bravest man,(if not the bravest ,with the exception of Lapu-Lapu) I have ever come across in Philippine history. It was said that while doing his famous trenches, he would merely shrug off dirt that settled in his uniform after a canon explosion. He would not run or duck as he believed that no one could tell where the cannons would actually land anyway. He simply had no fear of death. He was focused on serving the Mother country and he would gladly give his life ,if need be. And die he did in the Battle of Bacoor, Cavite in 1897, his skull completely shattered by bullets. Evangelista was a quiet and unassuming man. He was not a man of many words but a man of action. He could have been rich, living it up in Europe..he could have taken those job offers and prospered.But his heart was not in it. He came home to serve and to die. No regrets....He probably even died with a smile…. Few men of any age could have equaled the bravery of Edilberto Evangelista and fewer still could turn their heads away to riches and fame. Yet Evangelista never even looked back when he left Europe. This is the kind of man I would have wanted to lead my country during these times.But, he has long gone and sadly, we might never see the likes of him here in the Philippines ever again..